Hello and welcome to Bluegrass Shack Productions! 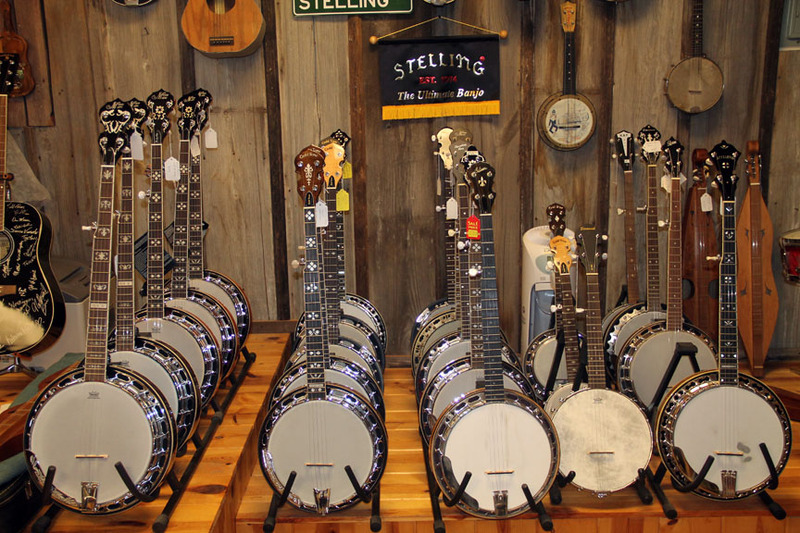 We specialize in acoustic instruments and accessories for bluegrass and folk musicians. We hope that you'll find just what you're looking for here. Our site is constantly being updated, so keep checking back. If there is something in particular that you are looking for, feel free to contact us. We also have a blog that you might want to visit. 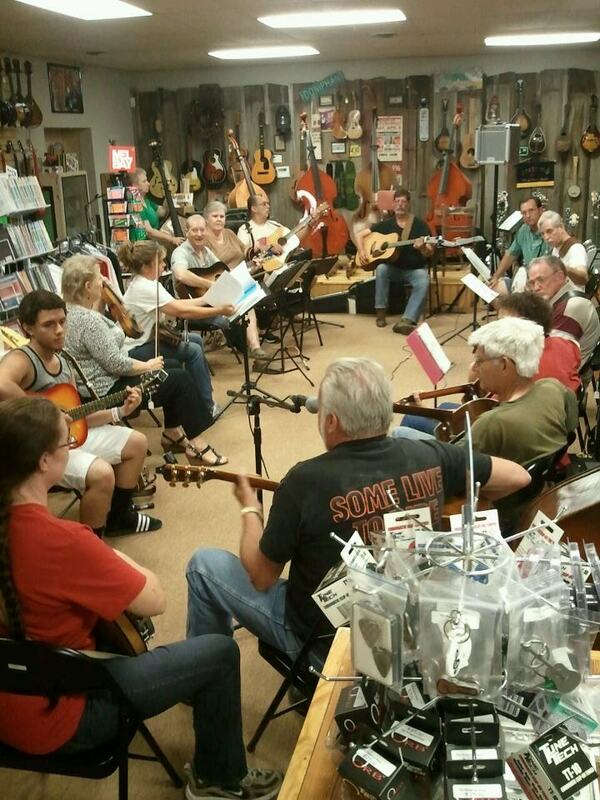 It has all kinds of information about our store, instrument repair, bluegrass music in general, lessons, personal experiences, etc. We are located in New Athens, Illinois, near the Kaskaskia River. We're in a very small town with no fast food restaurants and no stoplights! However, we do have several nice family restaurants and a marina, and we host jam sessions from time to time. You can view a video clip from one of our past jams: YouTube video. Our store hours are Monday through Thursday from 1:00 - 9:00 p.m.; Fridays from 1:00 - 7:00 p.m.; and Saturdays from 10:00 a.m. - 4:00 p.m. CST. We do close early from time to time, so if you plan on driving a long distance, please call us first at 618-475-3678. You may also call us for a special appointment if you would like to come at a time that we are not generally open. PLEASE NOTE: We will be closed for Easter April 19 & 20, 2019. We ship items out as soon as possible after we receive your order. If you are ordering an instrument, we need to have a street address -- not a P.O. Box! We almost always use FedEx to ship and insure our instruments. FedEx comes for pickups on Tuesdays, Wednesdays and Fridays. We ship the same day or the next pickup day after you place your order. 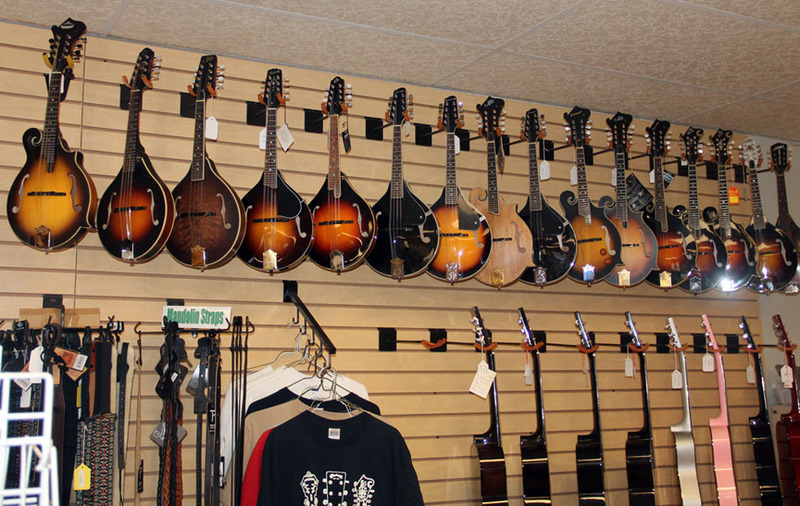 We just need time to setup your instrument (we don't ship instruments "factory setup" or no setup). You will receive a tracking number directly from FedEx that will tell you the exact day to expect delivery. We ship FedEx Ground for most packages, and USPS for most other orders. If you are ordering accessories without an instrument, your package will be shipped USPS. We ship the same day or the next day after you place your order on all in-stock items. If the item you ordered is out of stock, you will receive an e-mail from us letting you know that we don't have the item in stock, and you have the option to cancel your order for a refund, or wait for the item to come in. If you have questions about our instruments, accessories, shipping & delivery, or anything else, please ask! We'll do our best to help you in any way we can. We do ship to all 50 states and to many foreign countries; however, you will be responsible for partial shipping & insurance charges to these locations. If you place an order for shipment to anywhere other than the 48 mainland states, we will send you an additional Paypal invoice for the cost of shipping, or we will refund your money. We offer a 7-day, no questions asked return policy. If for any reason you are not satisfied with your purchase, please let us know right away. We will work with you to fix any issues or you may return the item. On our violins/fiddles, we also offer a 100% trade in policy. Click here for the full policy. RETURNS DUE TO SHIPPING DAMAGE MUST BE reported immediately. FedEx only gives us 3 days to report shipping damage or they will not honor the insurance claim. This means you need to open the box and inspect items immediately upon receipt. Chris' Students - Click here for Chris' 2019 Private Lesson Schedule. The Tuesday Night Open Jams have been discontinued until further notice. We are using this time for our students' lessons, workshops and classes. Join us for a jam session! 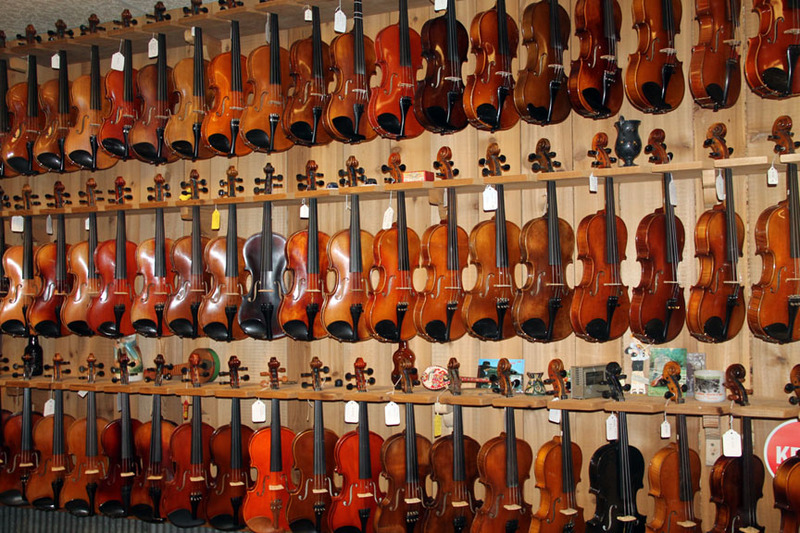 This picture shows some of our new and vintage fiddles/violins for sale. We have on-site repair for most acoustic and school band instruments.